School Committee Chair Betsy Murphy. Ahead of the impending storm expected to hinder much of the northeast, the Dracut School Committee closed the public hearing to the proposed Fiscal Year 2018 Dracut School Department Budget on Monday night to a largely empty audience. 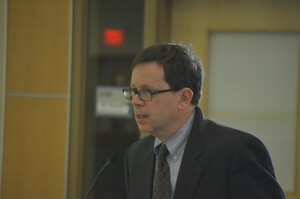 Dracut School Department superintendent Steven Stone provided an overview to the proposed budget, totaling $31,736,173. With other miscellaneous appropriation requests, such as the transportation budget, the expected figuring coming before Town Meeting voters is currently set at $31,116,096. Stone told the committee that Dracut’s per-pupil-spending figure of $10,600 was far lower than some other nearby school districts, largely due to low numbers of students coming from homes in poverty and a limited number of special needs students. Dracut parent Rich Cowan speaks at the School Committee budget hearing. However, later he told the committee that it is next to impossible to craft direct budget comparisons between districts due to varying enrollments and demographics. Some of the additional information from Stone showed an uptick in staff hires following a sharp decline after the end of federal Race to the Top funding in Fiscal Year 2012 as well as the rate of free or reduced price lunches more than tripling since Fiscal Year 2004. The only member of the public to comment during the public hearing was Rich Cowan, who voiced concern with a lack of proactive steps being taken by the School Committee to meet the district’s needs. In comparison, he cited a recent Board of Selectmen’s meeting where steps were being discussed to hire new police officers. Cowan’s testimony was truncated by School Committee chairwoman Betsy Murphy, who felt uncomfortable with Cowan stating that many other people shared his views. Cowan declined to continue his comments after Murphy indicated she would feel comfortable hearing more of his statements if he did not indicate that his views were shared by others. Following the meeting, Murphy had no comment on Cowan’s testimony. Cowan saw it as a missed opportunity. Later in the meeting, the committee held a first reading of two proposed policy amendments. The first dealt with an update to the department’s social media policy, requesting that all department employees make sure to indicate that any comments they make on personal social media accounts do not necessarily represent the views of the department. The second policy amendment requested an addition to the department’s technology use policy: a reminder to staff and students not to share passwords or other personal information.